There was nothing perfunctory about the final night of the NBA’s 2017-2018 season. There were 12 games on the schedule, including a de facto play-in game between the Denver Nuggets and Minnesota Timberwolves that the Timberwolves won in overtime. Even the 15 teams with playoff berths clinched had plenty at stake as zero playoff matchups were set. There were only teams locked into specific seeds after 81 games. Here is a rundown of the matchups in each conference and how we got there. This was updated throughout the night. This was locked in before the night. The 76ers wrapped this up by walloping the Bucks in the season finale. Sixteen straight wins! The Cavaliers lost to the Knicks at home by 12, but it wouldn’t have mattered. Miami got this spot by outlasting the Raptors in overtime and watching the Bucks decide not to show up against the 76ers. But given how great the 76ers are playing, maybe this was a pyrrhic victory? The Wizards followed up a huge win over the Celtics … by losing to a Magic team with massive incentive to lose for lottery positioning. John Wall and Otto Porter didn’t play, but still. Typical of their season. Portland snapped a five-game losing streak with a comfortable win over a tired Utah team at home to earn a division title and this seed. After all that, the Thunder have home-court advantage. A lot had to go right to get here. Oklahoma City beat Memphis as expected, then got two results go their way when the Pelicans beat the Spurs and the Blazers beat the Jazz. The Thunder were swept by Portland this year, but won three of four against Utah. Therefore, Portland’s win put OKC in a tie with Utah and New Orleans, and OKC had the best record in games involving the three teams. This was worst-case scenario for the Jazz. A loss combined with a Thunder win dropped them here. Had the Thunder lost to Memphis, Utah would have been the No. 4 seed and faced the Pelicans. New Orleans saved themselves from a matchup against Houston or Golden State by demolishing San Antonio at home. They could have risen as high as No. 5 had the Jazz won, but will settle for the No. 6 seed. San Antonio lost badly to the Pelicans in New Orleans and saw their seed drop when Oklahoma City beat Memphis as expected. They would’ve fallen all the way to No. 8 had the Nuggets defeated the Timberwolves. They won an OT thriller vs. the Nuggets to make the playoffs for the first time in 12 years. They could have moved up had New Orleans or Oklahoma City lost, but they did not. San Antonio owned the tiebreaker by virtue of a 2-1 head-to-head record. This entry was posted in NBA Playoffs. Bookmark the permalink. 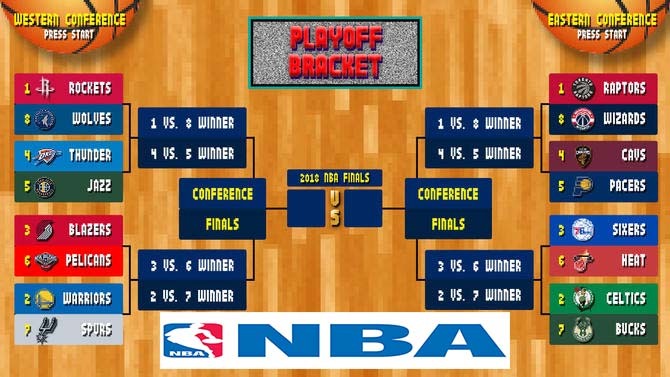 ← What if NBA teams could pick their 1st-round playoff opponent?